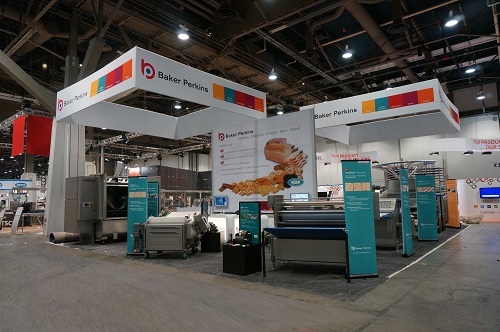 Two upgrades which improve the hygiene performance of existing Baker Perkins equipment were introduced at IBIE 2013. The first upgrade involves replacing the head of an existing wirecut machine with the latest TruClean™ wirecut head, delivering the benefits of superior access for maintenance and cleaning, best-in-class weight accuracy and user friendly operation. Product and speed ranges of each head are engineered to match individual requirements. The design of the latest-generation TruClean™ wirecut head involved a completely new approach to hygiene – with the choice of two levels to match specific cleaning regimes and cross-contamination risks. Every aspect of the TruClean™ wirecut head was reworked to offer quicker and more thorough cleaning along with easy maintenance. It meets or exceeds the hygiene standards expected by the industry and demanded by regulators. Giveaway and production costs are reduced through best-in-class weight control of +/- 1% on plain dough, achieved by unique die and filler block technology, fast changeovers and outstanding reliability. Upgrade two involves hygienic improvements to all aspects of an existing machine to make it more compliant with the sanitary standards recommended by the Grocery Manufacturers Association (GMA). Usually carried out as part of a general rebuild, the hygienic upgrades eliminate many potential contaminant traps and make cleaning much easier. Examples include fitting hygienic feet, hardware upgrades, adding continuous welds, eliminating sandwich points and filling unused holes. Guards and covers would normally be changed to stainless steel with sloping surfaces where necessary while the frame would be sandblasted and recoated. Many customers choose to carry out both upgrades and modernize the head and base of the machine at the same time. Hygienic upgrades are available across the complete range of Baker Perkins biscuit forming machines.